An eclipse is a rare and unusual event, when the world is transformed and the sky becomes a dark eldritch thing. It's a time when anything could happen, when any kind of story just might be true. That sense of the strange and wonderful guides Eclipse: New Science Fiction and Fantasy, the first volume in an exciting new annual anthology series edited by acclaimed anthologist Jonathan Strahan. Set to become a major event on the science fiction and fantasy calendar, Eclipse: New Science Fiction and Fantasy gathers together new science fiction and fantasy stories by the best writers working today. 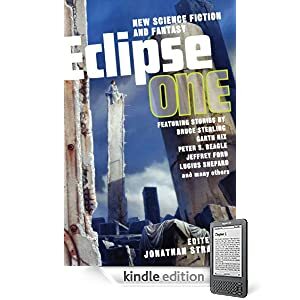 You can see that in Eclipse 1, which features extraordinary tales by Peter S. Beagle, Jack Dann & Paul Brandon, Terry Dowling, Andy Duncan, Jeffrey Ford, Kathleen Ann Goonan, Eileen Gunn, Gwyneth Jones, Ellen Klages, Maureen F. McHugh, Garth Nix, Lucius Shepard, Bruce Sterling and Ysabeau S. Wilce. Or purchase Eclipse One as a DRM-free e-book in the format of your choice through WebScription.net.